Are the Working Poor Working Hard Enough? | Bonnie Reilly Schmidt, Ph.D.
Are the Working Poor Working Hard Enough? Sometimes we don’t mind donating money toward helping people who are struggling with addiction or mental illness. But when we talk about helping the “working poor” questions are raised about their worthiness to receive that help. Most Canadians are descendants of immigrants who came to Canada looking for a better quality of life. In many cases, their ancestors worked extremely hard to gain the economic prosperity that they enjoy today. So, it is not unusual for them to question why the working poor need assistance; shouldn’t they just work harder to get ahead? 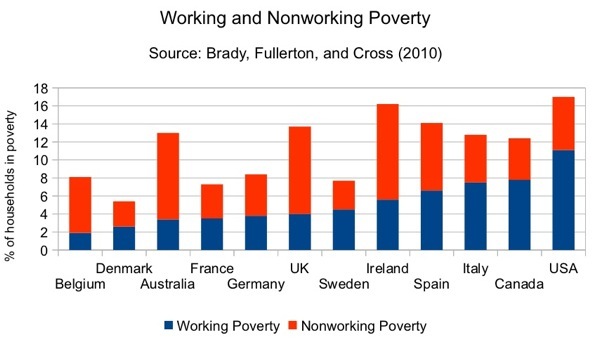 Although the working poor maintain employment they remain in poverty. In 2001, they numbered 653,000 Canadians. Young people, single parents, recent immigrants, Aboriginal people, persons with a long-term illness, seniors, and workers whose spouse is unemployed, make up the majority of the working poor. Additionally, 1.5 million persons, usually dependent children, are directly affected by the low income their parent(s) earn. The working poor can be self-employed or may work full- or part-time at contract, temporary, or seasonal jobs, usually at the minimum wage level. 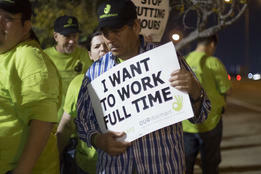 Most will earn less than $20,000.00 per year, $10,000.00 below the poverty line. None of them have benefits such as medical, dental, pension, or life insurance which contributes to their poverty. Family plays the greatest role in the economic uncertainty of the working poor. The greater the number of dependents, the higher the probability of a worker earning wages below the poverty line. A disabled spouse, partner, or child to support is also a factor. The level of education a wage earner has acquired is a determinant, as is a person’s ability to integrate into the labour market. Why don’t they just work harder to get ahead? In Canada, the working poor are exerting a significant amount of effort toward improving their lives. According to government researchers, “In 2001, most low-income workers demonstrated a significant work effort: 76% of them stated they had had 1,500 hours or more of paid work during the year. This percentage is slightly lower than that of workers who were not in a low-income situation in 2001 (88%).” The working poor are working hard, many of them at more than one job each year. Yet most find it difficult to make ends meet. They are a growing number of Canadians who work but find it necessary to visit food banks, soup kitchens, used clothing stores, and charities that provide food. It is no longer unusual to see entire families in line waiting for a nightly meal. So, please consider the working poor the next time you make a charitable donation. Don’t assume that the people who use the services provided by charitable organizations are lazy or uninterested in bettering themselves. The lives of the working poor are more complicated and challenging than that, and they deserve to live with dignity and respect despite their income level. Dominique Fleury and Myriam Fortin, “Research Briefs – Canada’s Working Poor,” Social Development Canada, 22 July 2013. http://www.horizons.gc.ca/eng/content/research-briefs-canada%E2%80%99s-working-poor. “The Canadian Policy Research Networks defines a low-paid worker as someone who works full time throughout the year but who earns less than $20,000.” Fleury and Fortin, “Research Briefs,” f.n. 3. 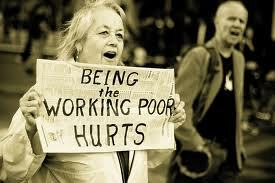 Statistics Canada determined that the Low Income Cut-Off (poverty line) was $30,487.00 after taxes in 2011. See http://www.statcan.gc.ca/pub/75f0002m/2012002/lico-sfr-eng.htm. Fleury and Fortin, “Research Briefs,” f.n. 3.